New for December 2007! 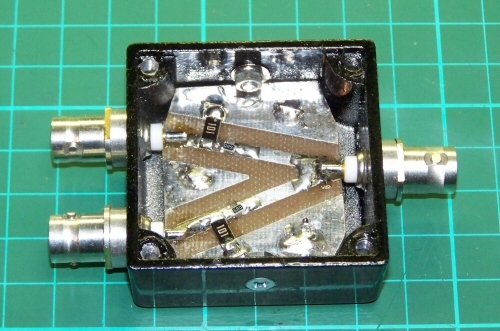 Kerry lives in Australia, retired from a non-electronics job to become an amateur RF/microwave experimenter and has built up his own RF lab that most small companies would be jealous of (including this one!) 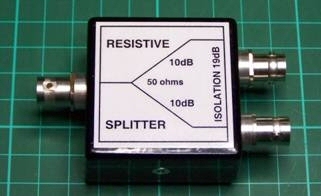 He built an equal split two-way Owen splitter based on the information we supplied on our original Owen splitter page. This is information available nowhere else, bwa-hah-hah! I just used the values shown in the schematic that Chris supplied and is on the M101 page; he shows 68R & 100R, 10 dB loss and 19 dB isolation. Not, perhaps, my most elegant production but it is only intended for sub-microwave frequencies (up to a few-100 MHz). The case holes for the BNCs are tapped; 3/8” UNEF is not common in Australia but I got a tap from a great Aussie firm, Suttons. I milled spanner-flats on the BNCs; 10 mm AF. I made 2.5 mm spacers on the lathe to fit under them. The machining work was done with my mini-lathe and my mini-mill.